Bohola, Co. Mayo 1901 Census Bohola is a small village of less than a thousand people positioned in the center of Co. Mayo and is not on most maps of Ireland. It is located five miles south of Swinford and ten miles east of Castlebar. At the center of the village is a RC church, a post office and the three pubs of Bohola (pictured above) at the old crossroads of Castlebar, Swinford, and Kiltimagh. Bohola Is divided into many smaller townlands that might include from five to a hundred families back in 1901 The 1901 census was also broken down by these townlands. The current names for the townlands are listed on the map below. The 1901 census information is presented alphabetically by townland. The current name, the original Gaelic and its meaning are given here. Older known names and spellings are given for each townland. Some of the names have changed in spelling many times over the years and some of the names go back to maps and descriptions from the 1600's. Populations and households are given for three time periods over the last 150 years showing a steep decline over that period. The heads of households in each townland are then listed from the 1901 census. This information comes from the history book BOHOLA ITS HISTORY AND ITS PEOPLE published back in 1992 by the Sheridan Memorial Community Center Committee. A sample of the actual census forms covering my family (the Monaghans) is given under the Clooneen section. The total census can be found on film at any Mormon/LDS Family History Center or through their local ward. The LDS microfilm numbers to request are 846232, 846252,and 846253. Also available at the LDS library is film of Bohola's RC church records covering marriages and baptisms dating back to 1860. Those microfilm numbers are 926003 and 1279230. It is hope that this information can be of benefit to some in locating their connections in Bohola. A fellow Boholan (at heart)---Tim Monaghan Ardaacarra Ard a Cartha---height of the heap or rock (other spellings) Ardacharha(1635)-Ardoghera(1655)-Ardouragh(1683)-Ardnacarrow-Ardnagarra- Ardacharae-Ardnagorra(1838)-Ardacarha(1848) Year Houses Population 1841 29 153 1901 19 81 1991 10 41 There were 19 Ardacarra homes in 1901 with 81 people. The families were headed by the following names: John Byrne; Winefred Byrne; Margaret Mulligan; John Walsh; Thomas Mulligan; Anne Mulligan; Anthony O'Neill; Honor Mulligan; Honor Higgins; Edward McGowen; Patrick Jennings; Alice Boggins; Margaret Murtaugh; Mary Gallagher; John Gallagher; Samual Higgins; Thomas Corcoran; Bridget Doherty; and Martin Mullin Altbaun Alt Ban---the white cliff or declivity Attybane-Altabana-Altebane(1635)-Altybane(1823)-Altabaune-Altbane- Altubaun-Althabaun Year Houses Population 1841 23 121 1901 17 102 1991 6 14 The 1901 heads of households were: Michael Boyle; Thomas McNicholas; Francis Mulderig; James McNicholas; Pat Lyons; James Browne; Pat McDonagh; John McNicholas; Thomas McNicholas; Annie McNicholas;James McNicholas; Hugh Forde; Pat Cannon; James Cannon; Thomas Mulaney; James Lyons; and Mary Lacy. Balinlag Baile an Laig---town of the hollow or pit Ballaghboy(1655)-Ballagh Buy(1683) Includes area know as Ardgullan Year Houses Population 1841 22 133 1901 27 138 1991 5 25 The 1901 heads of households were:Pat Higgins; Bessy Lavin; Thomas McNicholas; Bridget Salmon; Pat McDonagh; John Keane; Dorothy Conway; Pat McNicholas; Michael Creaby; Bridget McNicholas; Thomas McNicholas; Bridget Hyland; Thomas McNicholas; Pat McGowan; Maria Campbell; Thomas McNicholas; and Michael Durkin. Barleyhill Cuoc na hEorna---hill of barley Year Houses Population 1841 27 155 1901 16 91 1991 6 16 John King; Daniel O'Connor; Margaret Aitken; Edward English; Michael Swords; John Carroll; Mary McEvey; Michael McManus; Martin Byrne; James Gallagher; James Walsh; Denis Mullaghy; Martin McEvady; Thomas Manley; John Walsh; and Michael Walsh. All were heads of households in 1901. Bohamore An Bhothog Mhor---the great booth Tawnaghaghabo-Tawnaneboe(1635)-Tawnaghbohe(1655)-Tawnoboa(1683)- Tavnaghnabo(1823)- Bohagmore-Bohymorry(1838) Year Houses Population 1841 20 129 1901 16 83 1991 5 19 1901 HOHs:Catherin Clisham; Martin Foy; Bridget Foy; James O'Neill; John Foy; Matthew Foy; John Rielly; Michael Foy: John O'Neil: John Foy; Michael Sweeney; Peter Foy; Mary Cocoran; Anne Cocoran; Micheal Boyle; and Thomas Conlon. Bohola Both Ola---drinking booth or tent Bothcomla(1306)-Moycoula(1585)-Boholla(1635)-Bocholla(1635)- Buchola(1655)-Bohologh(1683)-Bohela(1844)-Bucholla(1844) Year Houses Population 1841 48 300 1901 24 126 1991 1 0 In 1901, Mathew Scanlon; Winefred Regan; Annie and Ellen Byrne; Thomas Byrne; Matin McNicholas; Thomas Mulroy; Anthony Tunny; Thomas Kilgallon; Michael McNicholas; James Jordan; Patrick McGowan; Catherine O'Donnell; Ann Larkin; John Roche; Thomas Foy; Thomas Burke; Anthony Ruane; Martin Foy; John Scully; Mary carroll, Bridget McGowan; Thomas McGowan; Sarah Tunny; and Martin Sheridan. In 1991, the unoccupied Sheridan Homestead is the only house left in Bohola. Carracastle Ceathramhadh A' Chaisleain---The castle quarter Rahelvine(1635)-Rahelvin(1655)-Ragh(1683)- Tavnaghnabo(1823)- Carrowancaslan-Carrowanchashell-Carrowcastle(1838) Year Houses Population 1841 35 215 1901 19 98 1991 11 39 1901 HOHs: Michael Walsh; Patrick Durkin; Marry McDonnell; John Hyland; Thomas Walsh; Michael Murtaugh; Michael Flannery; James Corcoran; Catherine Loftus; John Scanlon; Bryan Mulloy; Edward Gordon; William Moran; Mart Moran; Patrick Moran; Tim Gordon; Martin Murtagh and Michael Christy. Carragowan Cearamhadh Gabhann---the smith's place Kearow Igowen-Carrowengowen(1635)-Carrowgowne(1655)- Tawnoboa(1683)- Carrawangowwen- Carrawgowan(1838) Year Houses Population 1841 4 37 1901 4 24 1991 4 20 1901 HOHs:Thomas King; Thomas Colgan; James Groake; and Mary Mulroy. Carragalda Ceathramhadh Ghalida---the English quarter Carrowgollda-Carrowgalda-Carrowgolda-Carrowgoulda(1838) Year Houses Population 1841 39 67 1901 28 174 1991 18 57 1901 HOHs: Richard Fitzstephens; Anthony Gallagher; Bridget Deasy; Martin Howley; Michael Cummins; John Mulloy; Patrick Bourke; Mary Mulloy; Thomas Carney; Thomas Howley; Michael Devanney; Bridget Deacy; Patrick Deasy; Patrick Howley; Patrick Stanton; Michael Deasy; Ellen Lavan; Timothy Kileen; George Elliot; Thomas Bourke; Honaria Deasy; James F. Keary; John Devaney; Michael Hurst; John Comer; Patrick Mulroy; John Cryan, Daniel McEllin; Patrick Conlan; Thomas Mulroy; and James Commins Carroward Ceathramhadh Ard---the high quarter Lecarroward(1635)-Carraward(1837)-Carrowarde(1838) Year Houses Population 1841 32 197 1901 33 135 1991 9 25 1901 HOHs: Mary Deasy, Daniel Carty; David Jennings; James Sloane; James McNicholas; Margaret Sweeney; Ann McGuire; Patrick Jordan; Michael Ansboro; Peter Doherty; Honaria Cunningham; Patt Flannery; Edward McGowan; Pat Byrne; edward Mulroy; Patrick Delahunty; James Byrne; Anne Bourke; Thomas Burke; Margaret Durkan; Mary Leonard; John Leonard; James Foy, James McGowan; John Byrne; David Morely; and anne McGowan. Carrowkeel Ceathramhadh Coal---the narrow quarter Carrowkeele(1635)-Carrokeile(1683)-Carroekeile-Carowkeile-Carrowkeel(1838) Year Houses Population 1841 16 92 1901 13 56 1991 10 33 1901 HOH: Thomas Farrell; John Durkin; Bridget Ryan; Patrick Ryan; Mary McNicholas; James McDonagh; Anne Byrne; Michael Dunleavy; Bridget Kelly; Thomas Byrne; Michael Staunton; and John McNulty. Carrowmore Ceathranhadh Mhor--- the great quarter Carromore(1683)-Caromore-Carrowmore(1848) Year Houses Population 841 18 108 1901 10 48 1991 2 5 1901 HOH: Patrick McDonagh; Mary McNicholas; Michael Dowd; Hugh Ruane; Martin McNicholas; William McGowan; James McNicholas; Michael McNicholas; Thomas McNicholas; and Catherine McNicholas. Carrowntleva Ceathramhadh an tSleibhe---quarter of the mountain Currowantleva-Carrowntleva(1838) Year Houses Population 1841 13 78 1901 13 71 1991 4 11 1901 HOHs: Annie Clarke; John McLoughlin; James Mullany; Henry Franey; William Clishim; James Tunny; James McNicholas, John Foy, Francis Clarke; James Kilgallen; Mary Kilgallen; Michael Bourke; and Michael Clarke. Clooneen Cluainin---small lawn or meadow Clunyne(1635)-Cloonyn(1683)-Cloneen-Clonyne-Clownyn-Cloonin(1838) Year Houses Population 1841 26 160 1901 24 114 1991 10 24 1901 HOHs: Mary Kilgallon; John Jeffers; John Kilgallon; Edward McDonagh; Augustimne O'Malley; Sarah McDonagh; John Byrne; Margaret Boyle; Mary McNicholas, John O'Neill; Thomas Monaghan; Mark McDonnell; Mary Mellett; Mary Mcdonagh; Sarah Mcnicholas; Mary Kilgallon; Thomas Jeffers; Bridget Joyce; Marian Swift; William Mulloy; Patrick Mellet; James Bourke; William McNicholas; and Mary O'Neil. Below are links to the actual 1901 census forms for the Clooneen townland and the Monaghan family farm. Link to 1901 census forms covering Clooneen/Bohola Link to 1901 census form covering Monaghan farm in Clooneen Gortnasillagh Gort Na Saileach---Field Of the Swallows Year Houses Population 1841 11 75 1901 8 45 1991 4 14 HOH in 1901: Ellen Groarke; Owen Colgan; Anthony McDonagh; John McDonagh, Thomas Moran; Bridget Conwell, Patrick Lavin; and John Healy Lecarrow Leath Ceathramhadh---the half-quarter Lahcarrow-lecarrrowe(1838) Year Houses Population 1841 6 47 1901 6 26 1991 2 5 1901 HOHs: Danial larkin; Peter McNulty; Mathew Higgins; Martin McNicholas; James Groake; and Thomas Groake Lisgorman Lois Goirmin---Gormeen's fort Lyshgorman(1635)-Lisgormyne(1655)-Lisgorue Cullerath(1683)- Lishgormyne(1838)-Lisgormin(1848) Year Houses Population 1841 24 138 1901 17 85 1991 14 30 1901 HOHs: John Marron; William Hoban; Owen Lavelle; Catherine Groak; Patrick Foy; Catherine Lyons; John McNulty; Margaret Groake; Patrick Bartley; Anne Kenny; John Convey; Catherine Lavelle; Michael Lyons; Mary Staunton; Patrick Halle; and Patrick Halle Lismarrane Lois Mearain---Maran's fort Lismmerrane-Lissmirrane-Lissmerran-Lysmerrane(1635)-Lishmearan -Lissmerane-Lissmearan(1635)-Lismoraan-Lismiraun-Lismaran(1838) Year Houses Population 1841 29 177 1901 20 116 1991 19 44 1901 HOHs:William NcNicholas; Thomas Lyons; Patrick Kelly; Thomas McNicholas; Patrick McNicholas; Michael Durkin; James Durkin; Catherine Walsh; Patrick O'Dwyer; James Brennan; James NcNicholas; Thomas McNicholas; Patrick McNicholas; Honor Philbin; James McNicholas; Mary Cryan; Catherine McNicholas; Bernard McDonagh; Patrick McDonagh; and Patrick McNicholas Lissaniska Lois an Uisce--- fort of water Lissinisk(1635)-Leniske(1655)-Serisk(1683)-Lysinisky(1823)-Lissenesky(1838) Year Houses Population 1841 0 0 1901 0 0 1991 1 ? Listrisnane Lios Troisneain---Trusnan's fort Listrustan(1635)-Listrustane(1655)-Listrisnaan-Listrisnan-Lisstrisnane(1838) Year Houses Population 1841 20 108 1901 15 84 1991 7 14 1901 HOHs: Michael McNicholas; Michael Coleman; Edward Forde; George Elliott; Bridget Boyle; Andrew Walsh; Patrick Naughton; Edward Coleman; James Heston; Barthalomew Jordan; Patrick Richard; James Kelly; Thomas Durkin; James Carney;and Patrick Naughton. Rathruane Rath Raudhain---Rowan's fort Roearowaner(1655)-Rearwan(1683)- Rathroudin-Rathroyne-Rathruoyne-Rathrowan(1838) Year Houses Population 1841 38 220 1901 15 71 1991 13 77 1901 HOHs: Bridget Muldoon; Honaria McDonnell; Catherine Groake, James Judge; Catherine Scully; Andrew Carrol; James O'Brien; Michael O'Brien; Patrick Cummings; Michael McDonagh; Patrick McDonagh;Mary O'Brien; Mary O'Brien and Anthony Deacy. Rathslevin Rath Sleibhin---Slevin's Fort Rathslevine(1635)-Roslume(1655)-Baslauin(1683)-Rathlevin(1838) Year Houses Population 1841 29 165 1901 23 103 1991 10 29 1901 HOHs:James Jordan; Bridget Doyle; Michael Coleman; John McNicholas; Bridget Jordan; Thady Brennan; Mark Brown; Thomas Philbin; Katie Philbin; John Loftus; Annie Farrell; Bridget Naughton; Pat McLaughlin; John Brennan; John Murphy; Matin Davin; Mary Byrne; James Conlon;Pat Conlon; Michael Naughton; Mary Walsh; Thomas Higgins; and Pat Higgins. Shanaghy Sean-Achadh---the old field Shanachy-Shanoghie(1635)-Shanogy(1655)-Zenohie(1683)-Sanahy(1838) Year Houses Population 1841 25 156 1901 18 98 1991 8 25 1901 HOHs: Mary Donnelly; Bridget Malee; John McNicholas; Patrick Higgins; Peter McDonagh; Thomas Keating; Patrick McDonagh; Thomas McNicholas; Pat McNicholas; William McDonagh; Catherine Malee; James McHale; Thady McDonagh; Anthony McDonagh; Owen McDonagh; James McNicholas; Michael Mullee; and Bridget Higgins. Shraheens Sraithinidhe---little straths or holms Tawnaghnesrohane(1635)-Tawnaghshrow(1655)-Tawnasrohan(1683)- Tavnaghshruffane(1823)-Srahan-Srahany-Sraheens(1838) Year Houses Population 1841 18 128 1901 16 61 1991 6 18 1901 HOHs: Mary Kilgallen; Richard Kilgallen; Martin Kilgallen; James Kilgallen; Anthony Rouche; Timothy Kenny; Ellen Gallagher; Anthony Corrigan; Thomas McNicholas; Martin Walsh; Anne Bradley; James Bradley; MichaelCaroline; and John Kilgallon. Tavnakinaffe Tamhnaach a'Chreamha--- field of the wild garlic Tawnacrow(1641)-Tavnaghcraugh(1823)-Taunykinnaff(1838)-Tawnagaknaff(1848) Year Houses Population 1841 14 80 1901 10 51 1991 7 31 1901 HOHs: Michael King; Patrick Franey; Thomas Clarke; James Mannion; Mary Clark; Margaret Doherty; Patrick O'Brien; Anne Rouche: Catherine Reddington; and Patrick Mulloy. 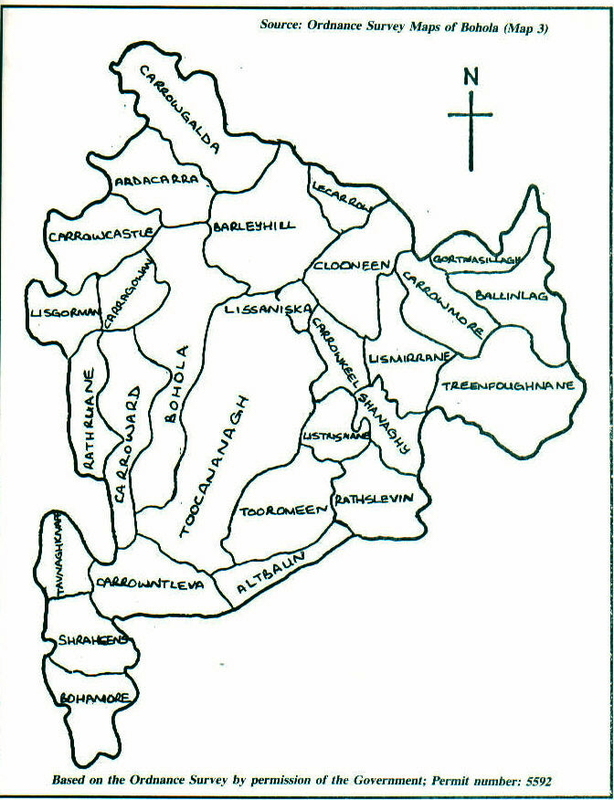 Toocananagh/Toughnane Tuath Cananach---the district of the canons Toghanon-Twochannen(1635)-Tohannane(1641)-Toghanau(1683)- Toughanana(1823)-Tooknanagh-Toocanananagh-Tuohcananee(1838) Year Houses Population 1841 133 718 1901 61 317 1991 10 29 1901 HOHs:Michael Byrne; Maria O'Neill; Honoria Kilgallon; Mary Burke; Bridget McDonagh; Andrew Byrne; Martin O'Hara; James Flannery; John Cavanagh; Hubert O'Hora; Patrick O'Hara; Patrick Berry; Bridget Clarke; Bridget Byrne; Darby Kilgallon; Mary Deacy, Patrick Gallagher; John Coleman; Julia Deacy; Patrick Kelly; Michael Clarke; Bridget McDonnell; James Dunleavy; Bridget Dunleavy; John McDonagh; Edward Jordan; Thomas Jordan;Michael McNicholas; Ellen Martin; Catherine Henry; Patt Lavin; John McDonnell; Patrick O'Boyle; Patrck O'Hora; Bridget Byrne; John P. O'Connor; William Keary; Patrick Clarke; Rev. John O'Grady; Mick Staunton; Pat Burke; Miles Jordan; Sabina Moran; Mary Ansboro; Thomas McGowan; Thomas Lavelle; Patt Jennings; Bartley Jordan; Edward Lavelle; Daniel McGowan; Thomas O'Boye; Alick Dunleavy; Margaret McGowan; Celia McNicholas; Ellen Gilmartin; and Margaret Keane. Tooromeen Tuar Omin---green field (Omin-bleach green) Tuoromyne(1635)-Turromeoth(1655)-Tueremoat(1683)-Toorumeen- Tooromin-Tuorhomine(1838) Year Houses Population 1841 28 193 1901 34 178 1991 9 18 1901 HOHs; Patt Carney; Patrick Ryan; Thomas McManus; Edward Conlon; John Murphy; Thady Conlon; John McDonagh; Richard McNicholas; Patrick Conlon; Anthony Deasy;Michael Conlon; Thady Conlon; Michael Conlon; Henry King; Patrick Conlon; Martin Higgins; Bridget King; Nicholas King; John McNicholas; Mary McNicholas; James Moran; Andrew Clarke; John Clarke; John McNicholas; Hannah McNicholas; John Reddington; Michael Elliot; Thomas Byrne; michael Roache; Owen Morris; and James Conlon. Treenduff Prior to the 1901 census Treenduff was considered part of Toocananagh Year Houses Population 1901 27 156 1991 13 33 1901 HOHs; Patrick Hunter; Annie Carroll; John Clarke; Thomas Clarke; Maria Carroll; Dennis Carroll; Mary Carroll; James McAndrew; Luke Clarke; Anne Kelly; Joseph McNulty; John Clarke; Patt Foy; Michael Jordan; Thomas McNicholas; Bartley Jordan; Charles Ryan; Mary Hunter; James McNicholas; James Clarke; Luke Clarke; Margaret Conlon; Patrick Conlon; Thomas Noone; THomas Jennings; and Michael Noone. Treenfoughnane Trian Fothanan--- the third of the thistles Trinfonhamish(1635)-Trynefoghane(1655)-Treanfohanaun-Trianfohananagh- Treenfoughnane(1838) Year Houses Population 1841 64 321 1901 51 261 1991 4 10 1901 Heads of Households were: Michael Sweeney; James Murtaugh; Pat Kelly; John Creby; Thady Ward; Bridget Kelly; John Kelly; Mary Brennan; Pat Ward; Margaret Ward; James Delaney; Patrick Cuff; Thady Ward; Catherine Ward; Honor Ward; Bridget Ward; Pat Egan; Charles Kelly; Michael Higgins; Pat Kelly; James Walsh; Margaret Peggy Sloan; John Kelly; Pat Creaby; Mary Walsh; Richar Creaby; William Ryan; Timothy Doyle; Patt Brennan; Pat Ward; Luke Burke; Richard Brennan;Elizabeth Doyle; Martin Doyle; Patt Brennan; John Brennan; John Brennan; Patt Shannon; Patt Lavin; Bridget English; Anne Shannon; Thomas Doherty; Patrick Lydon; Anthony Tunny; Dudley Kelly; Thomas Brennan; Horora Doherty; Richard Brennan; Bridget Carroll, Pat Kelly; Anne Brennan . To join a mailing list of those interested in Bohola, its history, and its people just email: IRL-MAYO-BOHOLA-L-request@rootsweb.com with the words SUBSCRIBE in the body. Then email IRL-MAYO-BOHOLA-L@rootsweb.com with you comments or querries. Responses may come through the mailing list or directly back to you. Link to Monaghan Clan of Bohola Link to History of Monaghan Family Name Link to Monaghans of Belleville N.J.